Oral histories formed the nucleus of the early Fort Collins Local History Archive. In the early 1970s, local historian Charlene Tresner established a Fort Collins oral history project to collect the memories of people residing in Fort Collins and Larimer County. Over time, others in the community have captured interviews that explore a variety of topics including the sugar beet industry, ranching, and historical businesses. 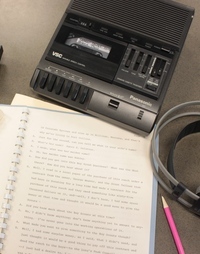 The Local History Archive has hundreds oral histories in the collection; over 300 interviews have verbatim transcripts with one copy on hand for research at the Archive and another copy available for check out at the Old Town Library.